Today’s roundup is a collection of our favorite WordPress hotel themes for 2016. Some are display-based only, while others are full-featured with booking options and even payment processing built into the framework. We are always on the lookout for great themes that we’ve missed, so let us know if there are any hotel themes you think we should include. As a proud hotel owner, you take great care to make sure your hotel is in top shape and offer the best possible customer experience. It’s only natural your hotel theme should do the same. Be on the lookout for a responsive and attractive design with plenty of opportunities to include photos of your establishment. Custom functionality such as a booking form is a must to allow your website visitors to book their room on the spot. An events calendar is a convenient feature so you can display room availability or highlight events happening in your area. Make sure your chosen theme is responsive and allows for easy customization options so you can get your hotel website up and running in no time. It goes without saying that hotel and motel owners, as well as boarding house owners, will have the most benefit from using a professional hotel theme. However, even smaller, family-owned bed and breakfast businesses can use a hotel theme to their advantage. Individuals and families who rent their homes might also benefit from a hotel theme. Lastly, if you’re an intermediary agency specializing in providing accommodation for tourists, you would also do well with a hotel theme. 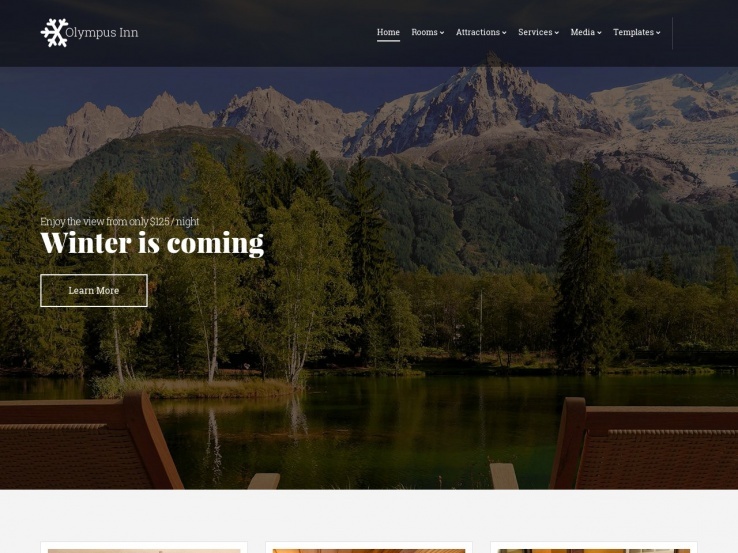 Haven is a multi purpose hotel WordPress theme for any resort website, be it a BnB, Hostel, Room Reservation or any other Villa/Vacation Rental service. This template comes with 3 Demos that cover multiple hotel services branches. Each of the Demos shows the flexibility to create a gorgeous website: clean design, lots of functionalities, suitable layouts and much more. Haven comes bundled with a neat slider with 6 types of customizations available and two free premium sliders: Layer Slider and Revolution Slider. Use Google Fonts and the Visual Builder to create great content that is SEO friendly. Haven includes an external booking system that is incredibly easy to use and swift integration with the most relevant platforms in the hotel & travel industry. 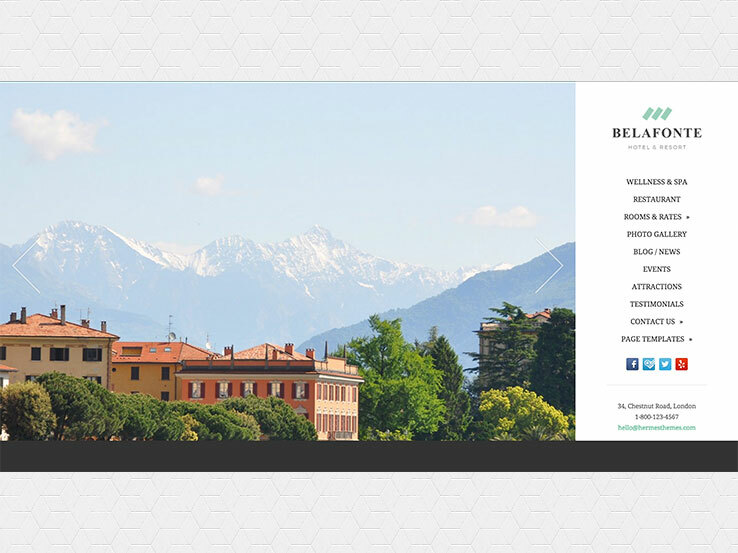 Bellevue is a beautiful bed and breakfast WordPress theme from Themovation, the theme company that brought you other popular choices such as Entrepreneur, Pursuit, and Eatery. It’s the ideal theme for anyone starting a vacation rental, Chalet rental, beach house, or Airbnb. 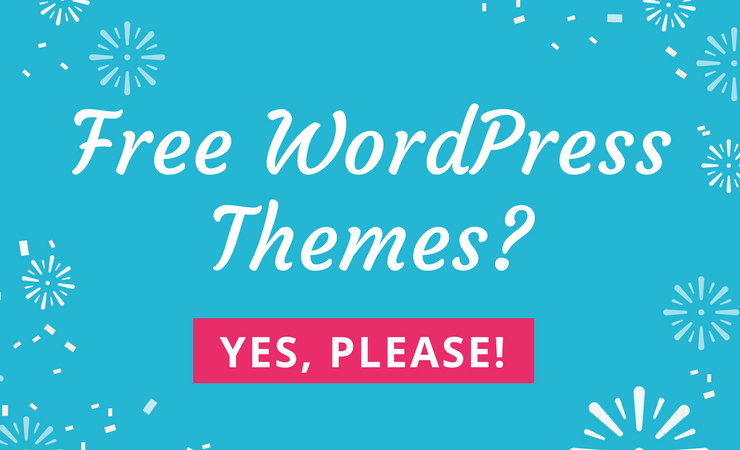 It comes packaged with everything you expect from a premium WordPress theme and all of the extras you could want when setting up a website. The theme includes a built-in booking system with current availability calendar so you can begin taking registrations from the moment your website goes live. 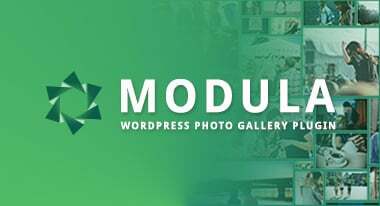 It comes packaged with a premium version of the WP Booking System Plugin, a pro version of the Master Slider plugin, and has built-in WooCommerce support. Additionally, you’ll have access to 50 layered Photoshop files and 5 awesome logo graphics to speed up your website development process. If you are starting a new room for rent business or have one but need a new website, Bellevue is the perfect theme for the job. Restinn is a hotel and motel WordPress theme designed for both the small mom-and-pop single outlet establishments and the multi-branch hotel chains. It comes with a suite of premium features specifically built for the needs of boarding establishments. A full-featured booking system automates the process of managing vacancies and scheduling room use and a wide array of frontpage layout options make transforming your website as simple as a few clicks of the mouse. The theme is fully responsive, so it looks fantastic on both full-sized desktop monitors and handheld mobile devices. It comes packaged with two premium plugins: Visual Composer and Revolution Slider, providing you with unparalleled ability to customize pages, banners, and layouts to perfectly reflect your business message. 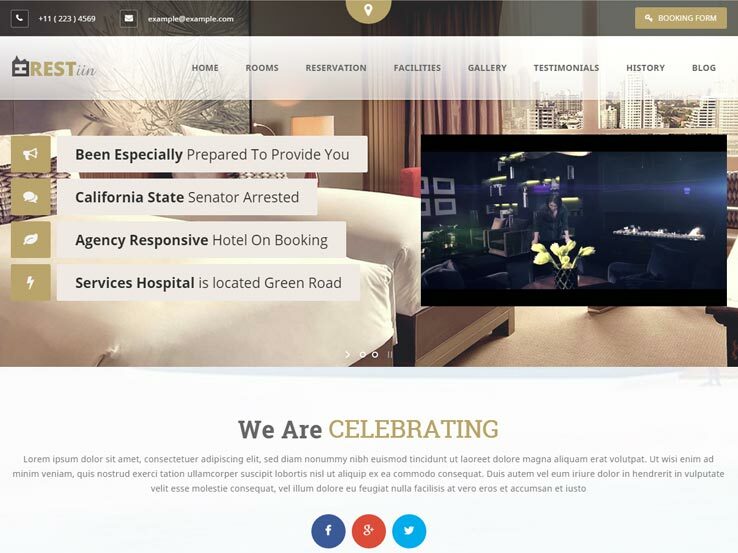 If you’re looking to develop a website for your hotel or motel, Restinn should be on your list of themes to review. 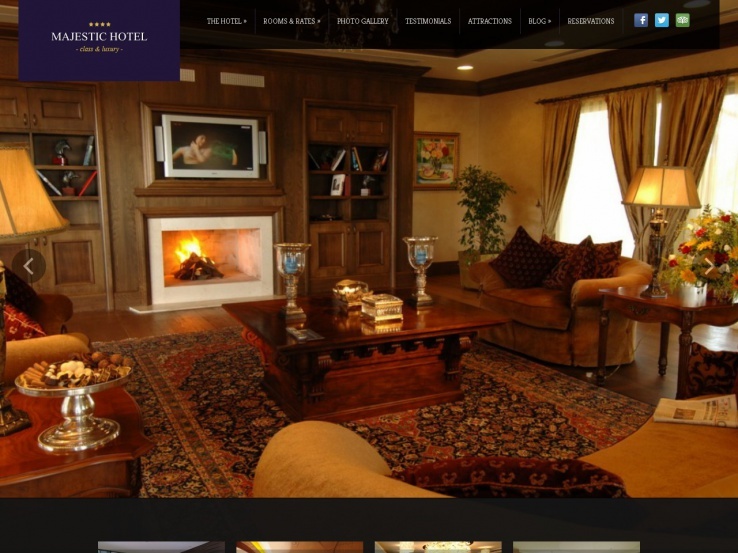 The HotelEngine Comfy theme sets a warm and inviting tone with which to publicize your hotel’s benefits. A full-featured booking plugin is also included. The stunning hero image at the top is an attention-grabber that is sure to make a great first impression on your website’s visitors. Reservations can be easily made as the booking form is positioned immediately below the header. Further down the page you can showcase your amenities and provide testimonials from your past guests. The backend of the theme comes with a powerful options panel, which allows you to customize every aspect of the theme. You can easily add your own logo, change the color scheme, add your social media icons, and more. There’s plenty of widget areas to further customize your website’s layout. On top of that, the theme is SEO optimized and provides support for the WPML plugin so you can easily reach an international audience. 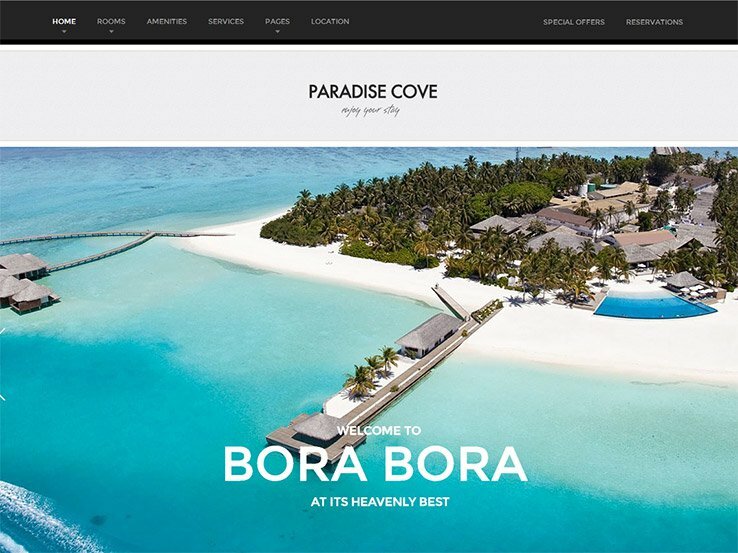 Modern, high impact, and visually enticing, the Paradise Cove theme offers all the features needed in a great hotel site and the aesthetic polish that we’ve come to expect from ThemeFuse. Paradise Cove features a large header area which can be used for a slideshow to show your best features. The area below features an easy way to display your booking form, provide directions to your hotel, and display your gallery and nearby attractions as well as the dining options in the restaurant area of your hotel. There’s even room for a custom weather widget. Customization options of Paradise Cove do not disappoint. You can change colors, backgrounds, and much more directly from the WordPress admin in a matter of clicks. 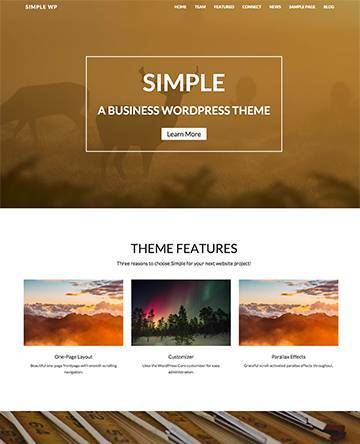 This theme includes three slider types, icon fonts, and a multitude of built-in page layouts including Location, Rooms, Amenities, and Services. Paradise Cove is fully responsive and cross-browser compatible. Totally responsive and offering a full-featured booking plugin, the HotelEngine Classy theme is clean and modern. 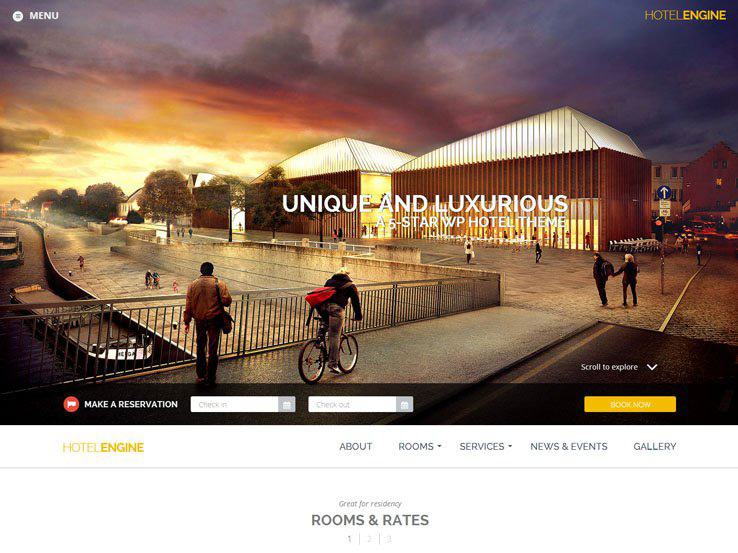 Featuring an impressive header area for a full-width image or a slideshow and a prominent booking form, HotelEngine Classy is sure to immediately capture your visitor’s attention. Your rooms and rates are immediately displayed below, facilitating the search, and further down you can proudly display your guest’s testimonials. There are plenty of opportunities to include beautiful image galleries, too. Like with HotelEngine Comfy, a custom booking form is included and the theme offers plenty of customization options, which are easily accessible through the theme options panel. Customize your colors, change the fonts, add multiple sidebars, upload your own logo, and more. Responsive design ensures your visitors from mobile devices will be able to see your website without any issues. 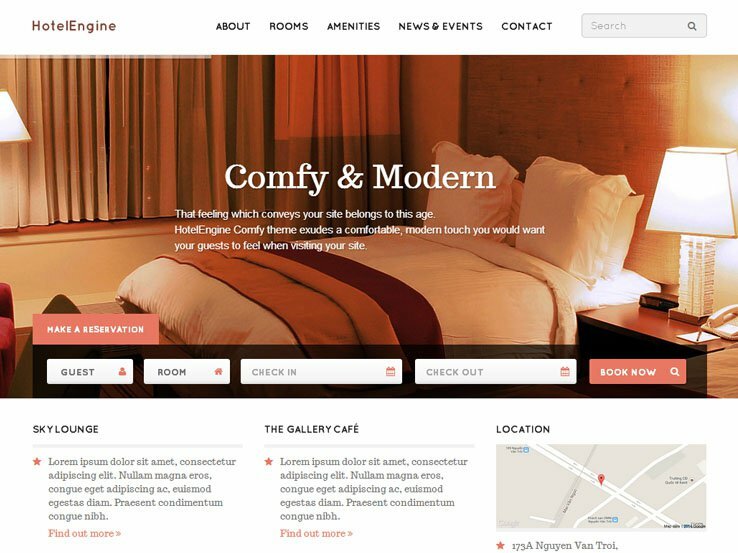 The HotelEngine Classy theme is sure to please anyone looking for a modern yet elegant theme for their hotel website. 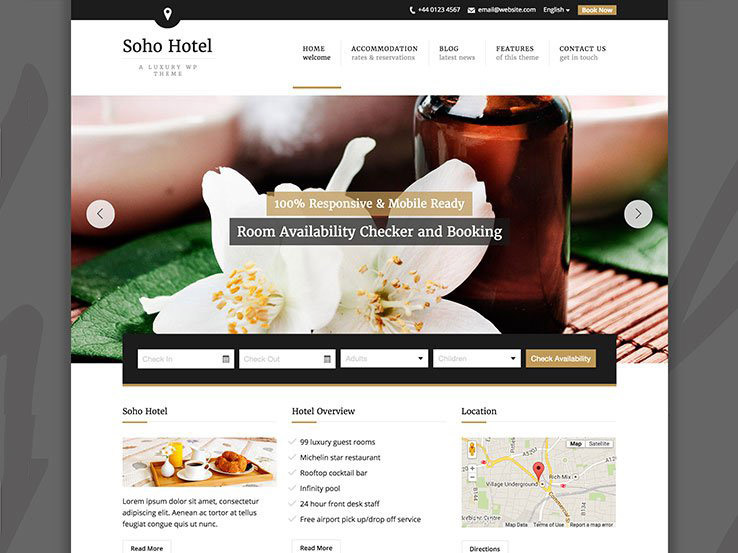 The Soho Hotel Theme is an Asian-inspired hotel or hostel WordPress theme that offers a booking system plugin, room deposits by PayPal and a room availability checker. The front page uses a slideshow header to catch your visitors’ attention and provides an immediate overview of your amenities and location. Testimonials are displayed right before the footer, which includes several widget areas giving you ample space to include your social media links, a custom social media feed, or any other type of widget. The theme is entirely responsive and comes with 19 layered PSDs. Customization options include four predefined color schemes with the ability to create your own color scheme and custom shortcodes to insert more complex design elements anywhere on your website. You can also customize and send booking emails via SMTP from your dashboard. On top of that, Soho Hotel integrates with the WPML plugin for easy translation. With a slightly vintage feel, this theme continues to offer great value to the right hotel, motel, hostel, or B&B. The homepage looks very minimalistic, drawing attention to the most important features of your establishment. You can easily display the link to your booking page, offer a seasonal discount or a promo code, and invite your visitors to sign up for your email list. The header area also includes space for your contact information so potential guests can get in touch with you. 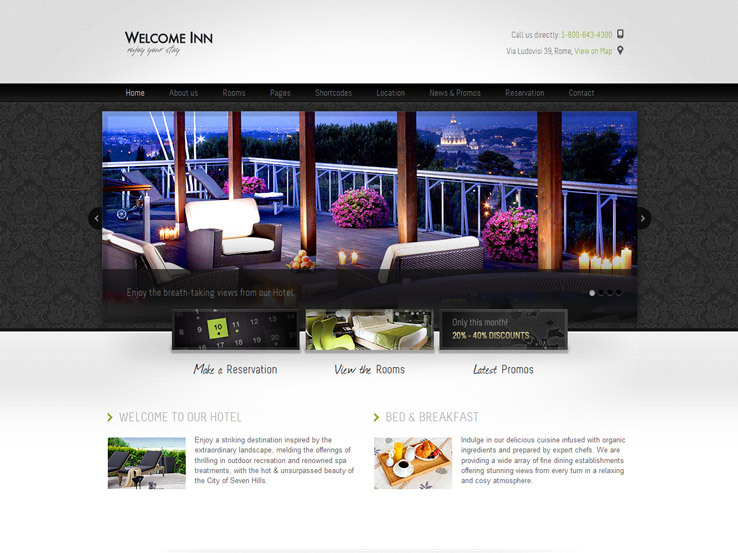 As with all ThemeFuse themes, Welcome Inn is easily customizable: everything from colors to fonts to the background can be adjusted through the theme options panel. Custom page templates are also included, allowing you to create a custom page for your location, rooms, and services, and more. This beautiful high-impact WordPress hotel theme is sure to offer your hotel the very best face for your brand. 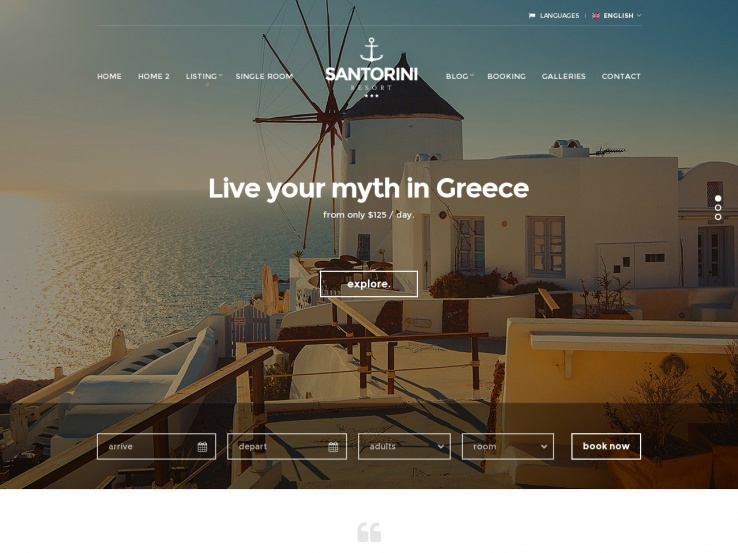 The Santorini Resort theme is eye-catching and comes with 10 different page templates and two homepage variations that allow you to create a website with a look and feel that fits your hotel perfectly. The homepage features a gorgeous full-width slideshow and a custom booking form. You’ll also notice a space to feature testimonials followed by beautiful image galleries and a space to feature your latest blog post. The theme customization options allow you to choose between various column layouts, adjust the visual style, and much more. Santorini Resort integrates with Google Maps as well as a custom weather widget. The theme is fully responsive and cross-browser compatible so you can rest assured your website will always look great. The Anchor Inn WordPress theme is optimized for retina support and offers unlimited color schemes that are meant to be easily customized. The theme is fully responsive and has an elegant and clean look with the most important features prominently displayed on the homepage. The header is followed by a booking form and further down you can present different packages available at your hotel or inn. Pages can be set to display with or without a sidebar and the theme includes shortcodes so you can easily insert more complex design elements such as buttons, tabs, toggles, and different column layouts on the fly. The documentation includes a detailed video help file so you can easily get started with your website’s creation and the theme includes full support. The Anchor Inn theme also comes with a custom Flickr widget and support for unlimited sidebars. 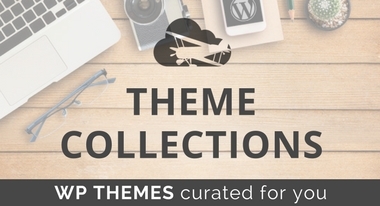 This flexible theme allows you to have full control over your website. Each post or page can have a custom slideshow or image, and you can alter the theme colors on the post/page level to get the precise look you want. Use custom video backgrounds and set audio options for each page. 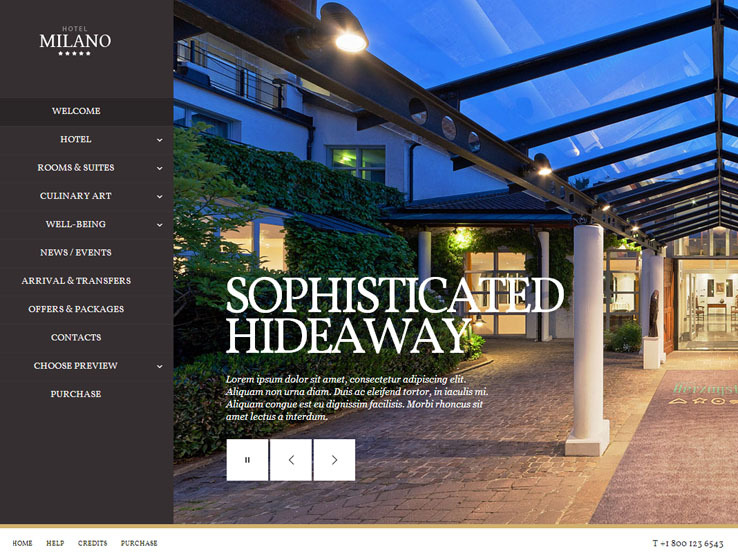 Milano has three different layout options making it a great choice for your website even if you’re not in the hotel industry. Milano is also ready to be installed on a multilingual website, giving you a chance to attract an international audience. 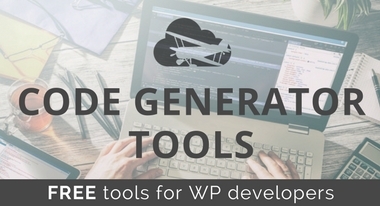 You can easily setup the theme with the included demo content; with just one click, you can import the content so all you have to do is replace it with your own. 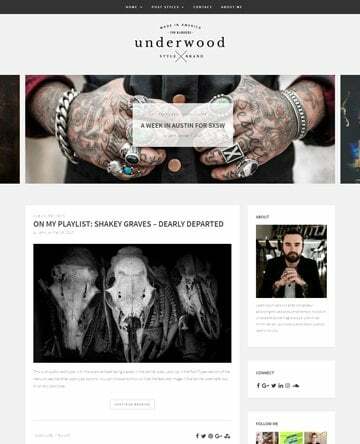 The blog page comes with a carousel layout and a classic layout with a sidebar. You can also add a custom portfolio or a gallery of your hotel’s amenities should you so choose. A HermesThemes product known as Leonardo, serves as a solid choice for anyone running a hotel or motel, with 15 built-in color styles for ideal branding options. The theme looks simple at first, with the classic two-column layout and a nice responsive interface, but it includes plenty of strong tools for keeping your hotel patrons educated about your business. The theme comes with an Attractions page template for helping folks get around the your local area. You can also upload a selection of high-resolution photos to the image gallery, then display all of your rooms and rates in a clean and concise manner. Move and modify the testimonials module to show your customers how happy your past visitors are and use the events calendar plugin to keep everyone updated on the hottest events at your hotel. A full service solution. 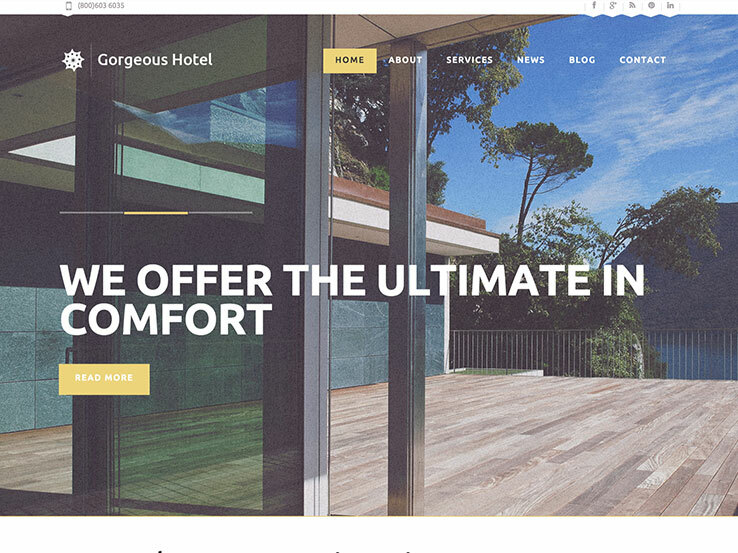 The Hotels Responsive WordPress Theme, a Template Monster product, delivers responsiveness and editing prowess with various custom post types and post formats. The theme provides over 80 shortcodes so you never have to play around with files to make your site look the way you want it to. The two-step installation is a nice touch, and the multiple color options ensure your site looks unique compared to others who buy the same theme. A stunning slider is included, along with a gallery for showing off your rooms and some nice modules to display items like services and amenities. Also, insert the the location map for easy navigation to your hotel or motel. The booking page is an essential component and is easy to use, offering a minimalist design. HermesThemes is at it again. 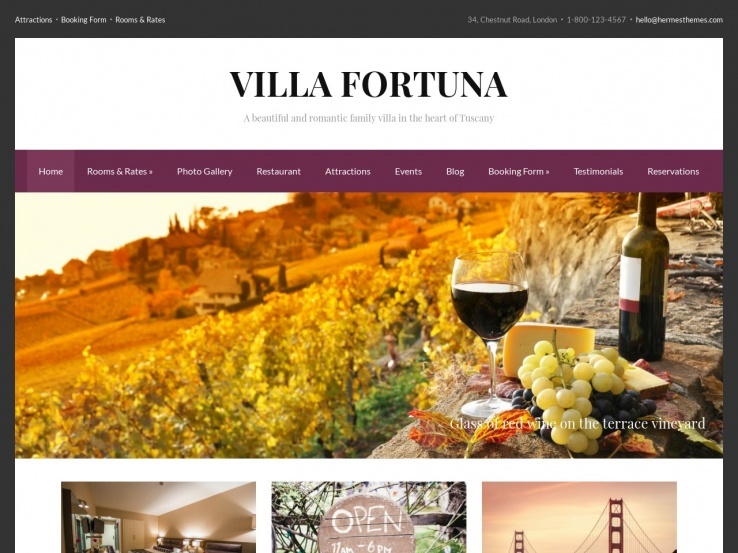 This company has a knack for designing workable hotel and motel WordPress themes. This product comes with light and dark color styles, and you immediately notice the fresh and bold designs that assist in grabbing customer attention. The widescreen homepage features a high-resolution slider for showcasing local imagery, and the custom page templates come in handy for designing items for testimonials, attractions, bookings, photos, and more. With SEO optimization and multilingual support, your customers will come from all over the globe to spend a relaxing night in your rooms. Although some of the HermesThemes options are rather expensive, the company doesn’t skimp when it comes to design and functionality. The Majestic theme is an example of that, with a full-screen slideshow to clearly indicate your modern sensibilities and attract attention. Custom page templates are a mainstay for HermesThemes, since you can add pages for testimonials, attractions, and bookings with a single click. This is one of your more standard hotel designs, so it allows you establish a site that caters to your customers quickly. It provides quick access to rooms and rates, photos, spa information, restaurant menus, and more. The custom widgets work well for quickly presenting items like testimonials in various spots throughout your website, too. Majestic is a solid choice. Hotelia, a solution from TeslaThemes, works wonders when it comes to white space, clearing out the clutter and placing the focus on items that matter. You can emphasize photos of your hotel rooms and highlight booking modules with ease. The clean and elegant design is fully responsive for viewing on multiple devices, and it comes packaged with the Revolution Slider plugin, which usually costs $30. 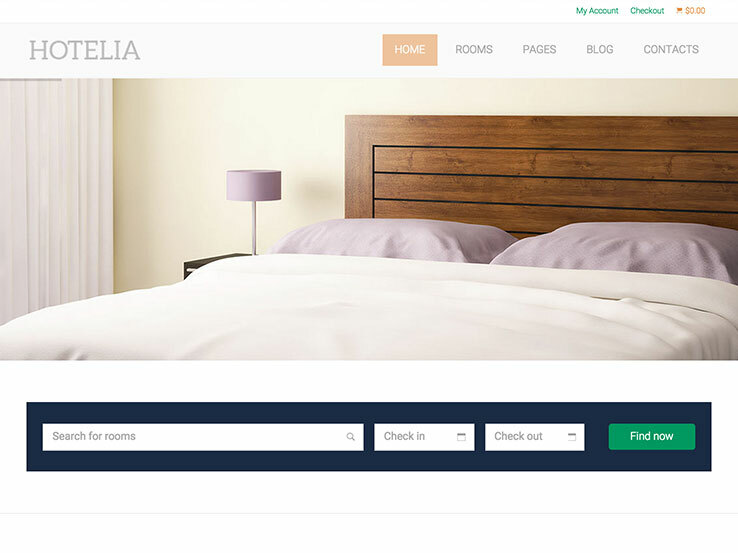 Hotelia is a top theme choice at a great value. The Visual Composer plugin (usually $30) is also included with the Hotelia theme, providing drag and drop capabilities so even the least knowledgeable designers can build a website that looks professional. 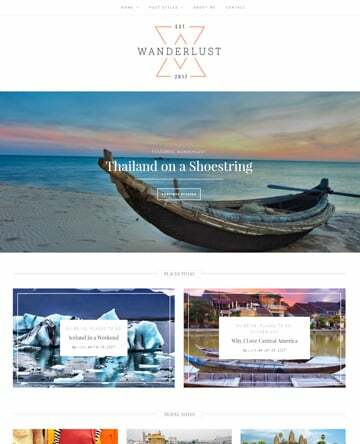 The theme is compatible with WooCommerce in case you plan on selling merchandise from your hotel, and the parallax effect is an interesting way to grab attention and push people to read more of your content. The sticky navigation stays within reader view no matter where they head on your website, and the advanced booking system quickly asks people how many rooms they require and what days they want to stay. This one is built all around the customer experience. 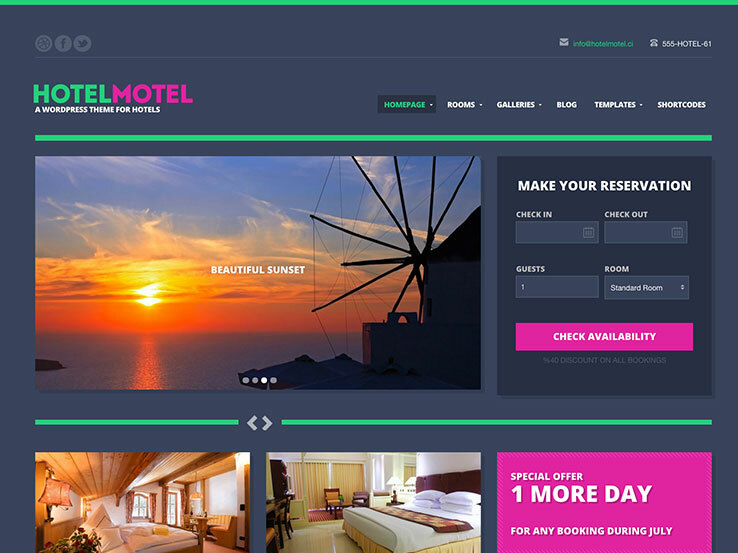 The HotelMotel theme is an wise choice, because it has a funky and stylish look to grab user attention and convince them to stick around for awhile. The preset darker background has some interesting color highlights, but always have the option to change. The responsive design comes with a booking form for letting your customers contact you before check-in. The powerful shortcodes are useful for placing anything on your site from the booking form to a slider. Custom widgets work well for implementing social media buttons and content areas, too. The HotelMotel theme provides various color schemes to choose from to best suit your brand. The flexible layout options allow you to build your homepage from widgets, which minimizes your design time and makes it easier for people who don’t know how to code. Feel free to place your contact information at the top of your page, and generate a full blog to share travel information and updates on your company. 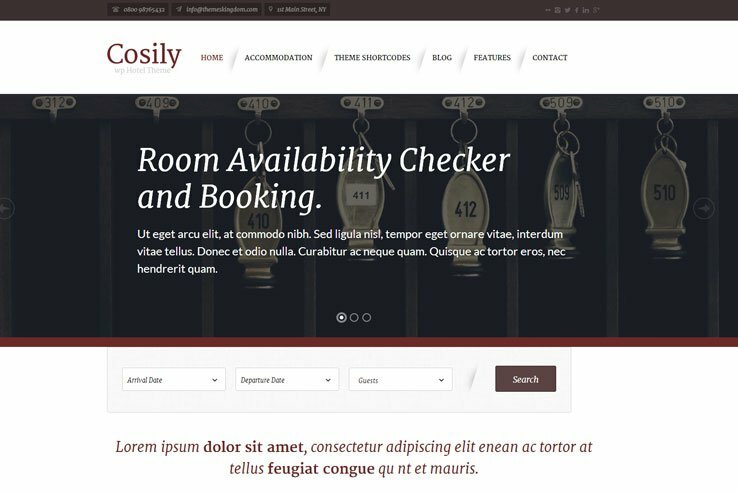 The Olympus Inn WordPress Theme is an option from the folks at CSSIgniter, and it offers a responsive design to prompt users to come to your hotel, motel, or lodging area. 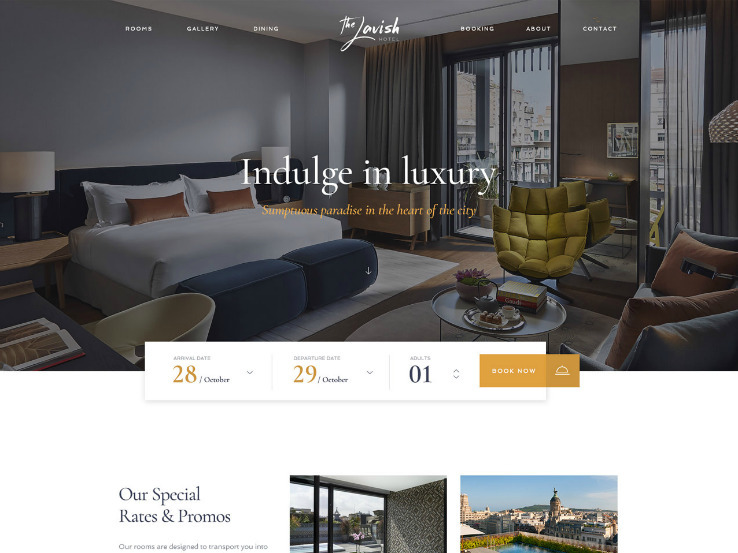 Similar to the HotelMotel theme, the Olympus Inn WordPress Theme provides a stunning booking form, which you can place anywhere on your website with a simple shortcode. The flexible layout works with a drag-and-drop editor to expedite the creation process, and the custom widgets are handy for implementing social media buttons, feeds and site information in your sidebars and footers. The Olympus Inn WordPress Theme has its own default colors, but webmasters have the opportunity to change them for branding purposes. When visitors land on the homepage they see a large header, which you can change to your liking and even include overlaying text. Start your own blog to improve your SEO rankings, and reveal a cool weather widget in the top right hand corner to tell people what it’s like in your area. 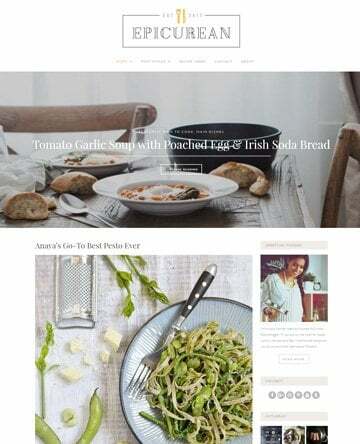 Along with branded social buttons, a newsletter subscription form, and an area to place testimonials, you can’t go wrong with the Olympus Inn WordPress Theme. 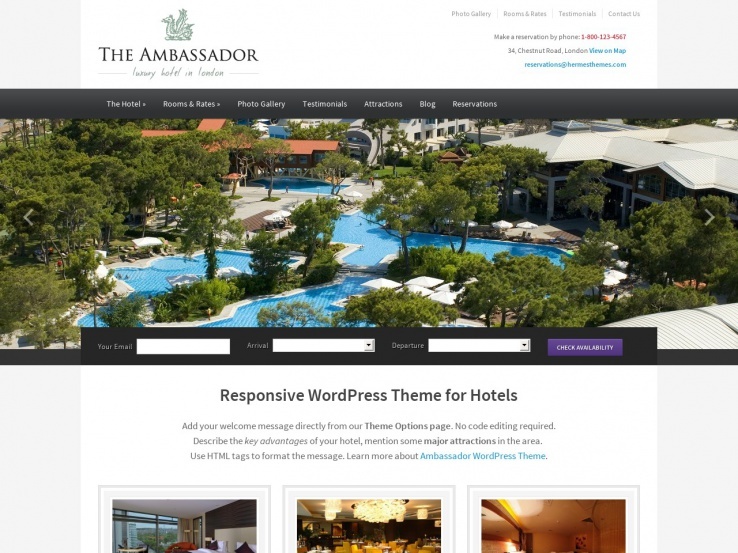 The Ambassador WordPress theme works well for businesses, resorts, and hotels. It offers a modern and intuitive design with high-resolution photo support and an events calendar for showing people what your hotel plans on doing in the future. Each of the events show up in an organized fashion, with links, images, and dates readily displayed. The theme options page is clean and easy to use, making it simple for beginners who don’t have any coding experience. Not to mention, the theme is responsive for people viewing on mobile devices such as tablets and phones. A photo galley template is useful for showing potential customers what you have to offer. An attractions page is key for displaying what types of things people can do around the area. Also, the testimonials area promises to bring in more customers since new users can see exactly what it is other people like about your hotel. All in all, Ambassador is a professional-looking choice for any hotel. The SixtyOne WordPress theme offers one of the cleanest options on this list, since it provides plenty of white space and elegant icons for showing that your hotel is a cut above the competition. In short, it’s a classy option with responsive elements so it’s guaranteed to look good on mobile devices. The flexible homepage layout gives you control over the featured slider. In addition, you can use several custom widgets to promote services and push people to follow you on social media. The booking form cuts down on the amount of time you’ll spend on the phone with customers, and the four content types include solutions for galleries, rooms, slider items, and testimonials. The theme includes numerous custom post and page types, allowing you to showcase customer reviews, info about the hotel’s interior and exterior, galley listings, contact forms, location information, and booking pages. Just about everything you could need is packed into this theme. Plus, it’s translation-ready and SEO optimized. WordPress hotel themes come in all shapes and sizes. The Nice Hotel theme is an outlier, because it strays away from all of the modern, flat designs. What’s great is that this theme still looks great, even though it hasn’t adapted to some of the trendier design features. As you can see in the demo, the Nice Hotel theme has a fixed width, along with an elegant spot to place your logo at the top. Each of the social media buttons reside at the top of the website as well, while the “Book Now” button is located right where people are going to see it first. All of your contact information is provided for people to see at a glance, and this still remains at the top of the site when people view it on mobile devices. The slider serves as an ideal location to showcase pictures of all of your rooms, too. The accommodation management area on the backend helps out with adding and removing certain rooms, images, and descriptions, while the booking wizard actually sends these requests directly to your inbox. This way, customers don’t have to always give you a call on the phone. The theme is translation-ready (an important feature for hotels that serve the international community) and it comes with four skins, an events management area, testimonials, contact pages, and more. 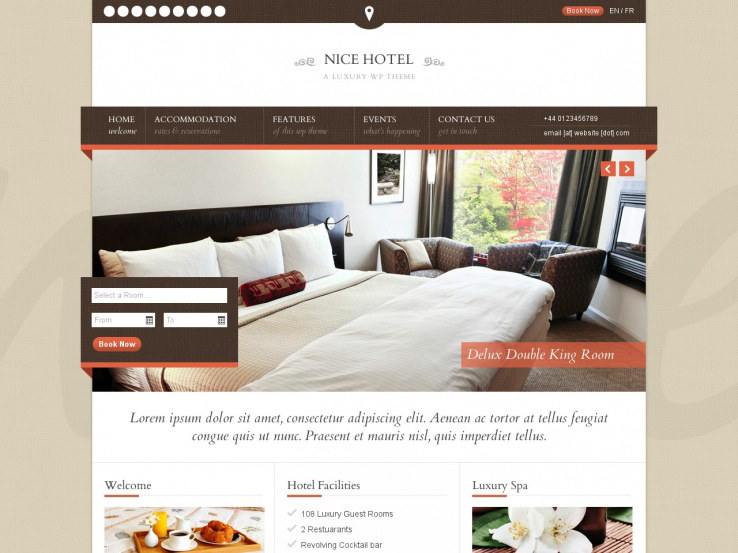 The Nice Hotel WordPress theme has what you need for a successful online presence. Check out the Belafonte WordPress theme if you’re interested in an option with a focus on minimalism and modern elements. Your top pictures are featured in a slider that takes up the majority of the screen, but you also get a navigational menu that sits to the right side, offering links to other pages on your website. Upload your top menu image, and use the social media buttons to build your brand’s following. All of your contact information can go right under the menu as well, and it reveals itself when someone brings up your website on a mobile device. Overall, it’s one of the more simplistic themes in terms of designing from the backend, but it yields wonderful results thanks to numerous media options. Multilingual support is packaged into the Belafonte theme, and a full blog assists with boosting your search engine rankings. Several page templates are offered for adding some variety to your site, while the photo gallery ensures that customers have a chance to easily view your amenities and rooms. All room highlights are accessible through unique pages, so you only have to upload a few images and descriptions along the way. A payment processing module is not provided with the theme, but plenty of third-party plugins can be integrated with ease. Cosily includes a visual page builder so you can create a unique homepage with speed! 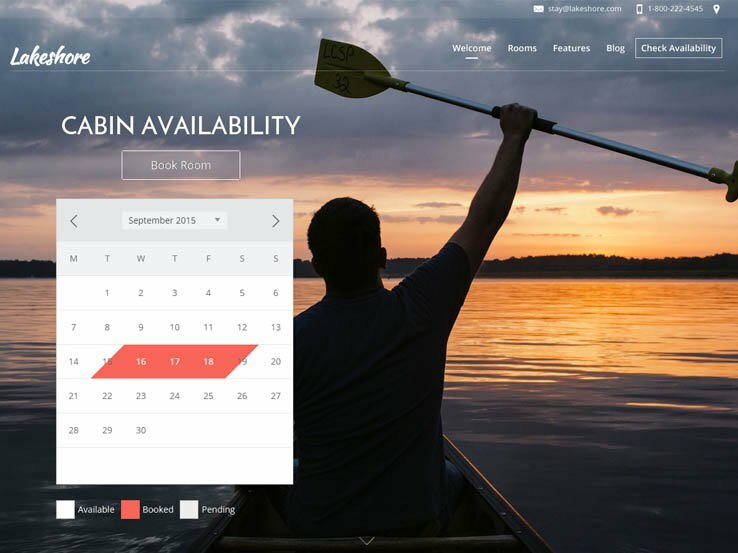 The simple booking system allows users to easily reserve a room, and awesome page templates allow you to create a custom-looking site in a fraction of the time. Cosily looks minimal and clean but it was built with your future guests in mind. The built-in booking system is incredibly simple to use and the homepage slider will wow them with your hotel’s photos. Rooms and galleries are easily accessible from the homepage and the elegant testimonials will give them the final nudge and convince them to visit your hotel. The customization options include complete control over the look of your website and include extra functionality such as Google Maps integration, custom widgets, several layout options and custom shortcodes which allow you to change complex parts of the theme without coding knowledge or other technical skills. http://themeforest.net/item/spa-treats-spa-restaurant-woocommerce-theme/3002682, and if found to be meeting your exacting standards, give it a slot in this list…thanks. Loved all of them! You show here themes very low priced like Santorini, throught one of almost two hundred dollars. 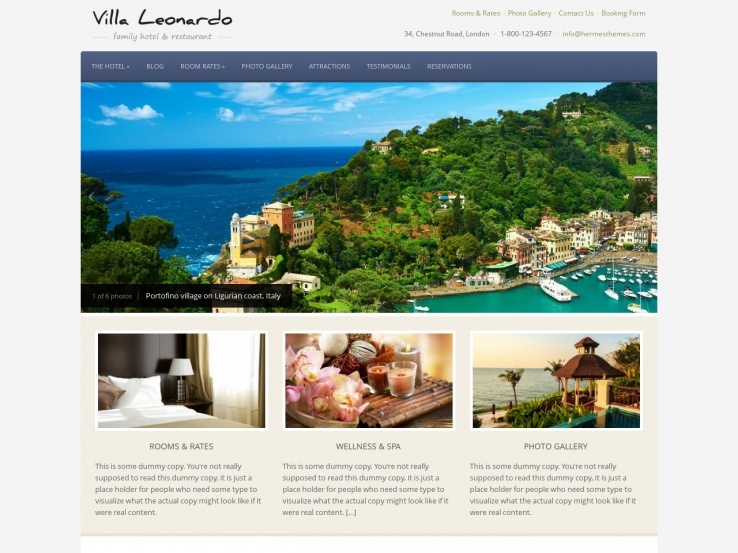 Do you have or know about Hotels search Engine WordPress theme? Check out our plugin, it uses custom post types to create multiples price lists, amenity sets, rooms detail pages and a room listing page. It is not a theme or booking plugin but a plugin geared toward making it easier to setup and manage rooms, amenities,prices…etc. It also features shortcodes for creating your own pages or posts. Loved all of them! Thanks for the great collection. Glad you like our post! You can also check the theme Chateau by Templatic. 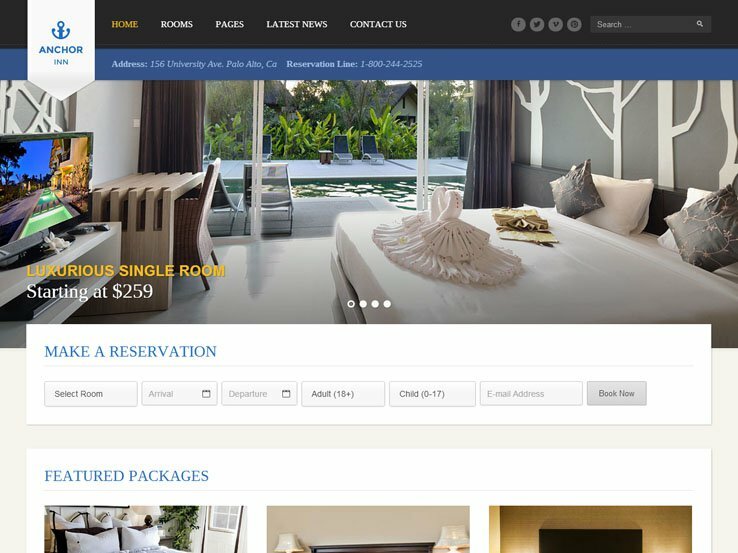 It is an attractive WordPress Booking theme which is best for Hotel industries. It is an advanced booking theme with the ability to manage multiple properties. Chateau does look like an impressive theme that should be checked out. Thanks for the suggestion! Great post! 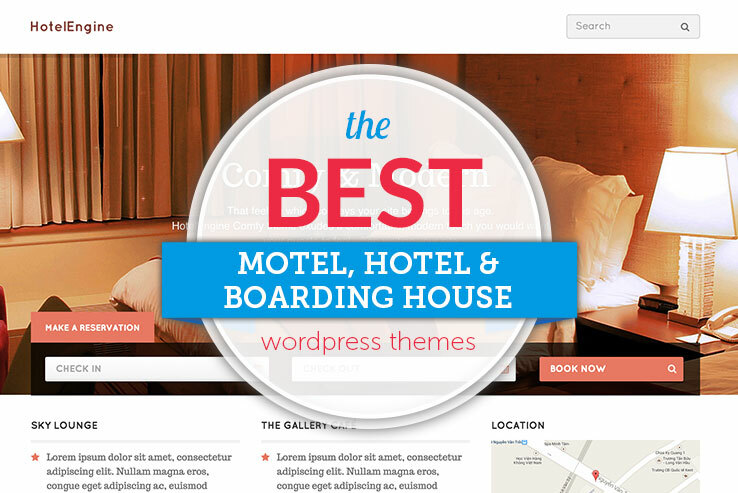 My Favorite Hotel WordPress theme is Restinn- A Booking One Page Theme For Resort Hotel. Thanks for sharing it. Thanks for the feedback! we really appreciate it!